TGIF! I have the day off and I plan on enjoying it as much as I can. Hopefully this time around we'll make it down to the OC, and if all goes as planned, I'll pop into the nail supply and see if there are any new collections. I've got to be selective with any choices I make though, because I'm running out of storage space for new pretties! 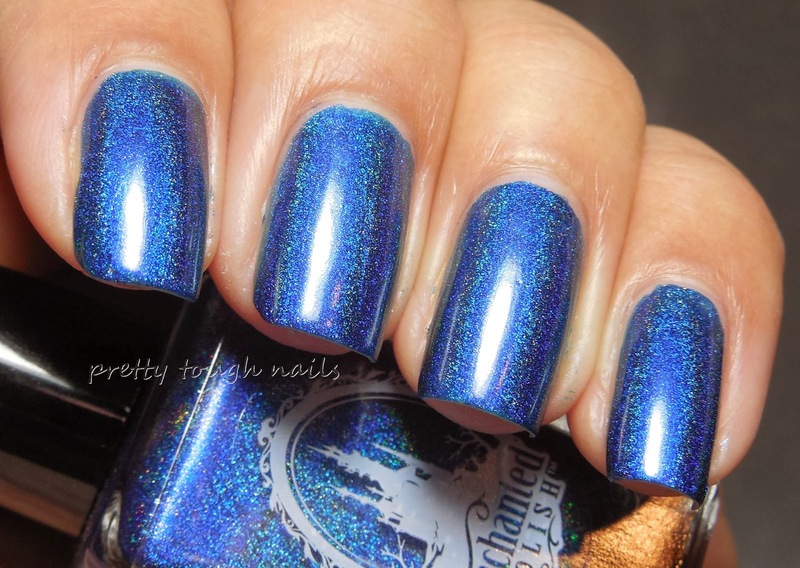 I'm going to keep in theme with dazzling polishes for the new year, and this next one is Enchanted Polish Presto Magic, a deep midnight blue linear holographic that deliciously throws rainbows left and right. Application was once again impressive with smooth consistency that flowed onto the nail with no streaking or patchiness. I might have been able to get away with one coat but I used two here for depth of color. No topcoat in these pics. I think this is the perfect winter blue because it reminds me of silent winter nights, with stars twinkling in the sky and casting a rainbow luminescence. I've always hankered for a OPI DS Glamour polish and after using Presto Magic, I think I've squashed that lemming because I found something better. Have you found your DS Glamour or similar? Very pretty, never seen or heard of this one before from Enchanted, when was it released? I've tried to get ahold of the Ninja Polish Glamorous, but no luck on that so far. Yes, December! It was hard to choose which ones to grab for but I knew this one would be a winner. I regret not getting Dime Piece or the Holiday but I'm happy with what I got. Loving it! 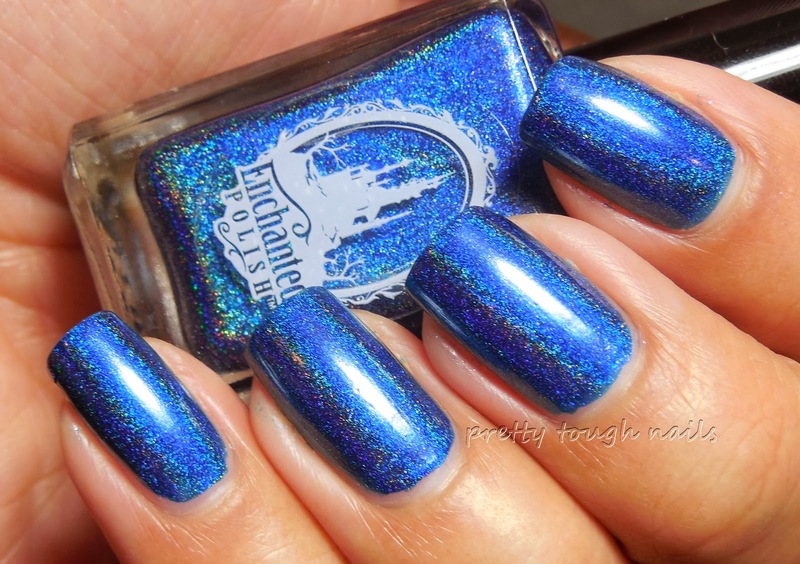 Holos rock my world so this one is gorgeous! Thank you! Holos are amazing in every way and color. 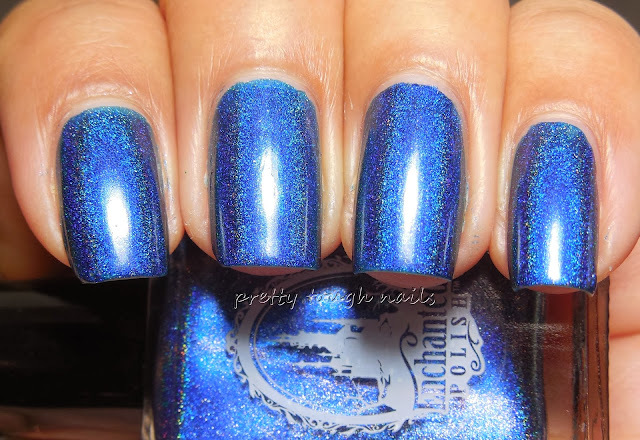 What a beautiful blue holo! The color reminds me of the brilliant blue you see in the sky at twilight before all the light is gone. Just lovely, and looks fabulous on you Thithi! Thanks dear! The blue is truly amazing! I don't have anything like it, and I don't think I want any else similar to it. This is one beautiful polish! Now you're making me want to pull out a holo and wear it, which is not a bad thing. I just love wearing them and staring at the rainbows. They are distracting! Luckily we live in places with sunshine year round... wear all the holos all the time! So beautiful! I can't believe I had this in my cart then decided to drop it! Argh.